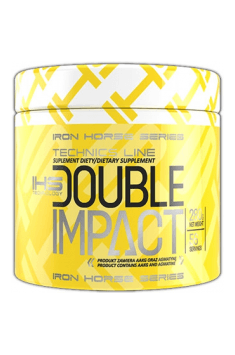 Double Impact is the highest quality pre-workout supplement recommended for athletes and active people. Product is based on arginine, citrulline and agmatine which contribute to imcrease nitric oxide synthesis in muscles. 1 portion (1 full scoop) dissolved in 200ml of water. Consume 20-30 minutes before a workout. When the need arises, it can be combined with other stimulants or caffeine to maximize the effectiveness of a workout. Iron House Series is a new Polish brand of diet and nutritional supplements for bodybuilders. The key feature that distinguish their products is the composition - only natural plant extracts. Among the company's products are protein and amino acid supplements to help fat burning and supplements increasing testosterone levels. Products are used by both beginners, and the experienced athletes. Supplement containing methylsulfonylmethane. It protects the joints and supports regeneration. Organic sulfur with high bioavailability. Supports joints and promotes the good condition of hair and nails. Dietary supplement that supports healthy joints and youthful skin. A dietary supplement that promotes joint comfort and mobility.